Childhood produces brilliant gulfs of laughter, rivers of tears of joy of unpracticed happiness, and it is an engorged and gorgeous thing to behold. Extended childhood brings titters and snickers and haughty guffaws, anxious eyes as the mouth gapes for its rising bell and gong of the throat. Rarely punctured with truly outrageous fits of an unhinged and harmless insanity, extended childhood is a maddening cauldron of inner early child mixed with the brewing Adult that will burst from childhood’s sparkling husk. Remember these facts as we enter the Long Hallway. Adulthood itself is the omniscient architect of this here Long Hallway. It is this here place that laughter is heard from beyond thick, thicker, thickest walls climbed with portraits of empty doe-eyes staring at plates of microwaved meatloaf – scratch n’ sniff to smell Momma. The laughter from beyond the portraits and walls are ghosts of the children who are not yet aware of their extended childhoods and the cicada form they will adopt when of age, encased in a sticky threading of mucous. The Long Hallway is where the Adult runs away from childhood and its laughter with a steer-matched gait, an awkward pounce in the front padding of the foot (hoof); where the Adult will feel a strange dragging from the ceiling, a tangled knotting of hair as the scalp (horns) scrapes the top and the narrowing of this place. And this is where the Adult will be presented with doorways that open on occasion to help the Adult see puffings of cloud, and gusts of wind which drag such puffings of white in a smearing not unlike paint probably to be named “melting marshmallow” in the instance that clouds were made of paint, in the event that components of Nature were meant to be named for commercially adorable purposes. The Long Hallway’s doors will show benches floating on the melting marshmallows, allow the Adult fantasized relief from the pounding of their running feet (hooves). The doors will close when the Adult chooses to instead suffer. The Adult will mimic the laughter from the childhood ghosts in an effort to conserve inner early child but this is in vain, and it is discouraged. The Adult will only laugh now when he sees a clear and concise conclusion to his suffering (literal leap of faith). It is not a tittering, not an engorging, but a hoarse, clucking roar from the belly of the beast. It will spook the laughter from the childhood ghosts for an eon before they return. The Adult will not ever reach the end of the Long Hallway unless he finds a door affixed with a small metal plaque reading “fin.” It will only open in the case of absolute emergency and it will only lead to a place of walloping flame (purgatory). The Long Hallway is largely unfurnished but there is a nice vase at the midpoint, a glossy and ill shade of pink, veins of marbled white. 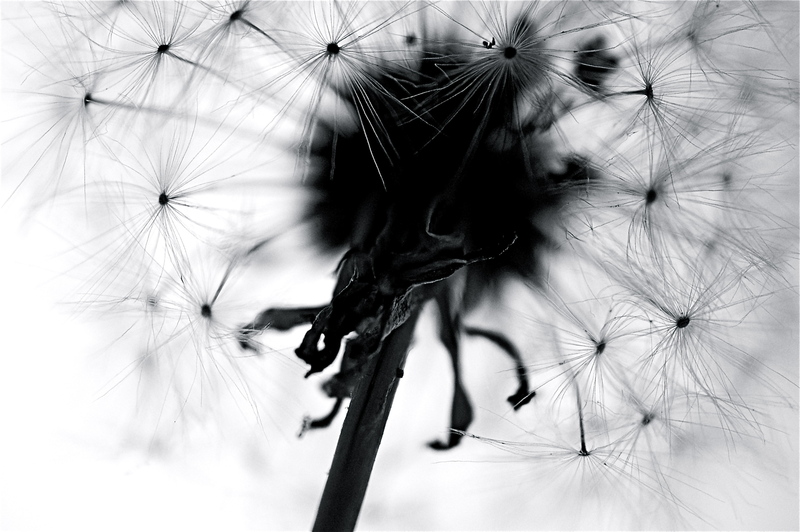 Inside is a bouquet of dead dandelions which, as every inner early child remembers, means a wish if you blow on the mammalian fuzzy cotton, spread its seed in a spray of ambitious prayer. Few Adults will ever find the vase. Some will smash the vase in a violent triumph. The others will cry when they see it and pluck a dead dandelion and immediately find the door marked “fin” and it will end there and it will all be okay, okay, the one and final wish will come true in a smacking pop of light as that spray of ambitious prayer clouds the hallway in a frothed fog and the Adult will vanish and the door marked “fin” will close with a comforting creak. The vase will have been purchased from a Goodwill for eighty-nine cents. The dead dandelions will have been absolutely free but, as any good and true Adult will tell you, nothing is really ever for free and how could you be so dense?